When you put comedians Marek Platek and Firdi Billimoria together you get one weird sketch show. From a bizarre instructional tape about interacting with others to a vacuum powered IQ adjustment device to the sound guy gingerly bringing out pictures to share with the audience, this was an hour that threw many strange ideas at the wall and hoped that they would stick. A lot of it was weirdness for weirdness sake but they managed to keep the audience in hysterics throughout. It was quite a wild ride with sketches that went all over the place and kept the audience on their toes. These sketches were generally a bit too long but by packing in as much variety as possible they ensured that interest rarely waned. They often veered into completely unrelated territory within a sketch. We assumed that they had segued into the next one by stealth but, through some twisted logic, they would connect back to the original idea and tie things up; sometimes neatly. Some scenes went to brilliant inspired places but others just petered out and had everyone scratching their heads over what they just witnessed. Regular deconstruction of the show and call backs displayed a clever side to the silliness and faux spats gave the impression that everything could fall apart at any minute. The thing that kept it all glued together was Platek and Billimoria’s talent in selling the material. Billimoria was great in being comically shouty and playing things straight while Platek did something wacky in the background. Platek pleased the crowd with his exaggerated facial expressions and was always up for stripping off his gear to look silly. The guys bounced effortlessly off one another and maintained impressive control over this anarchic setting even amidst an audience revolt. There was plenty of comedic tension to spice things up with some colourful insulting phrases and lots of slapstick, between each other as well as some innocent bystanders. Those expecting clear narrative structure may find themselves getting a little lost but those in the mood for the strange and bizarre will have a fine time. Marek Platek is here to regale us with tales of travelling back and forth through time and reveal what we can expect in the future. After the world’s most awkward costume change, we meet a time travel ticket inspector who is seeking our assistance in capturing a time fugitive. This is all happening because of a Worm Hole. 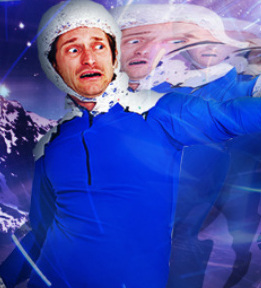 Decked out in blue Lycra and aluminum foil, Platek told us of his adventures. There are jokes about meeting himself and getting the chronology wrong. Rather lame facts about future customs and conventions were told with exaggerated gravitas including some social satire that was a bit too blunt to be amusing. There was a brilliant bit of historical political humour in his routine about which country replaces the USA as dominant nation. It was a real mixed bag in terms of humour, all delivered in an almost stream of consciousness manner while he ridiculously slinked about in his wacky outfit. Although this performance contains enough humorous ideas to catch your interest, you get the feeling that this was two similar ten minute concepts that had been stretched to forty five minutes. It’s essentially a guy from the future bragging about being a time traveller and not much more. There were long sections where the audience were smiling rather than laughing, which he tried to remedy with more slinking about the stage. A self-penned book (with an impressive cover knock up) was his main prop. He playfully spruiked it to us and read a poem from it (a verbatim reciting of a familiar song with little additional humour added). There were a couple of prop weapons that were briefly referred to in minimal detail and never seen again. It was a wasted opportunity. There was little in the way of plot development and the main character didn’t actually go on a spiritual or physical journey during our time spent with him. He just did his boasting and posturing before disappearing. Appearing in a different coloured Lycra jumpsuit (breaking his own time travel logic!) and a ridiculous headpiece, the Inspector addressed us in a similar manner to Platek. His inclusion in the show was for a single routine about two similar Hollywood actors. Once done with that bit he wandered out of the venue with the audience not exactly sure if that was the end of the show. Platek should be applauded for embracing the spirit of the Fringe and going off the beaten path, but in this case it didn’t quite make for a complete show.